Em 2004, na altura em que publiquei no DN um trabalho sobre a primeira e única reunião entre o primeiro-ministro, Vasco Gonçalves, e o presidente norte-americano, Gerald Ford, à margem de uma reunião da NATO, na Bélgica, em Maio de 1975, eu e o editor, o João Morgado Fernandes, só conseguimos uma foto do encontro. Foi essa que "entrou em página". Passados quase dez anos, encontrei na Ford Library "contact sheets" de fotos desse encontro. São momentos históricos. Há fotos de Ford e Henry Kissinger, o secretário de Estado norte-americano, de pé, à espera do "companheiro Vasco". Depois, vê-se Rosa Coutinho, o "almirante vermelho", com um sorriso (! ), a cumprimentar Ford. Um fotograma à frente está um menos sorridente Vasco a saudar Ford. Um exemplo de documento da Ford Library. No caso é um memorando de uma reunião do gabinete de Ford, na Casa Branca, a 4 de Junho de 1975, após uma visita do presidente norte-americano à Europa e uma cimeira da NATO, em Bruxelas, durante a qual se reuniu com o primeiro-ministro português, general Vasco Gonçalves. Esta reunião de Ford, Kissinger com Vasco Gonçalves - cujo memorando não está "on-line" - serviu de base a um capítulo do livro: "Diálogo de surdos em Bruxelas – O frente-a-frente de Vasco Gonçalves com Ford e Kissinger". De regresso a Washington, foi nesta reunião que Kissinger afirmou que o governo português poderia estar a fazer o jogo dos soviéticos. 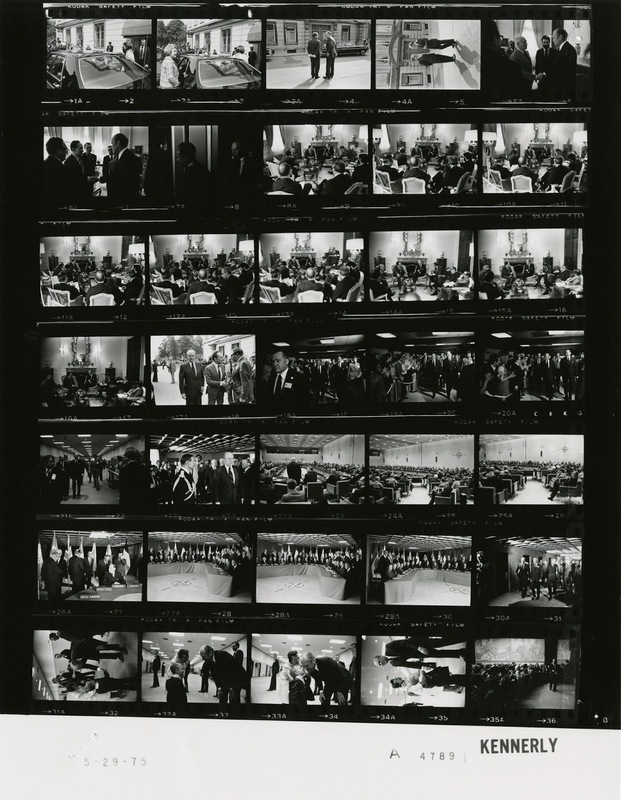 Notes of the Cabinet Meeting June 4th, 1975 - 2:00 p.m. The President entered the Cabinet Room at 2:10 p.m. The Press entered at 2:12 p.m.; departed at 2:15 p.m. The President opened the meeting and thanked the members of the Cabinet and staff for the warm welcome. He indicated that a major vote had just taken place and that the Administration sustained the veto on the Jobs Bill by a vote of 277 to 145. He mentioned that one week to ten days ago, the Administration could not have sustained the veto. The message the President gave to the Republicans was that if Republicans could not hold the line on this one, it would open the flood gate. The President was generous in his praise for everyone, specifically naming (for their testimony) Weinberger, Morton, and Zarb; and for the Congressional effort, Jack Marsh and Max Friedersdorf. The President added that he believed this was a significant victory, a major victory, and perhaps the most important vote for the Administration since he has been President. The President then began his discussion of foreign policy, indicating that he left with hopes and returned with no regrets. That in discussing that which had transpired in Europe on the return flight, the feeling was that they were very satisfied; it was a successful trip and they made all of the headway they had hoped to make. The President believed the meeting with NATO was important for several reasons: 1) To strengthen the Alliance, 2) To indicate his personal interest in and maintenance of European relationships; and 3) Also, to serve notice that the Alliance needs to recognize Spain as a part of NATO for the defense of Europe. The United States has an arrangement with Spain, which adds to the total defense of Europe. Historically, the European Community has not welcomed Spain because of its dictatorship and support of the German Empire during World War II. scribe his system of Government and it took the Prime Minister some twenty minutes just to tell the President how his Government makes decisions. It was suggested that the system was a bit chaotic. The President indicated that he believed there could not be a double standard, one for Spain and one for Portugal, in the United States' relationship with the two countries. Therefore, it was important that the United States maintains an interest in, and be candid with Portugal. In Spain the President's efforts concentrated on the military situation and the maintenance of the United States air bases there. It is important to Western Europe to have the Mediterranean area secure and United States bases in Spain add to that security. The President was warmly received in Spain and there were huge crowds on his motorcade route. In Austria the President indicated he tumbled into Austria, but that he really felt that Betty had tripped him, then ran away and left him to get to his feet all by himself. He indicated that the meeting with Sadat was excellent and the personal rapport between the two leaders is very good. He did indicate to Sadat that the United States was continuing its reassessment of the Middle East and that the United States wants to explore all facts, options, and possibilities. The President feels there are three choices to be made: 1) Resume step-by step diplomacy, 2) Develop a comprehensive settlement, which would raise serious problems with final frontiers, and 3) Specific bilateral agreements within the parameters of the comprehensive plan. The President indicated to Sadat that all of those would be taken into consideration during the reassessment. In Rome the President discussed the entire underside or belly of NATO, the Mediterranean area, Portugal, Turkey, Greece, Spain, and all of the problems related to that. He believes the Italians are making good progress on the economic front and while it is not decisive yet, there is a feeling that the Italians are doing a good job. The President said he was very impressed with the people he met in the Government, specifically citing Leone and Moro as being very sharp. He was cordially received and the discussions were very fruitful. The President mentioned that he had a very impressive audience with the Pope. He had been told the Pope was very sick, however, he appeared to be well, giving the President a good handshake and speaking in a very strong voice. He covered a wide range of topics in a long meeting. He was impressed with the Pope and with the reception at the Vatican. The President in summing up his trip to Europe, said the total trip signifies the forward movement and momentum of American foreign policy. In spite of the problems with Vietnam and all of Southeast Asia, the United States will stand firmly by its Allies; it will maintain its commitments, and American foreign policy will be strong and bold in future years. The President then asked Henry if he cared to make any comments. Secretary Kissinger said that when the United States first proposed a NATO Meeting, the Allies were not enthusiastic about it. It came at a very difficult time for the United States and no one in NATO was particularly excited about having a meeting. There was a discussion as to whether or not the United States should take new and creative measures, even some gimmickry in getting this group together. The final decision was made by the President, when he said he wanted to have a straight forward meeting with NATO with no ploy or gimmicks. Secretary Kissinger's belief was that the major point the President made at NATO is that the U. S. is back in business. The United States knew what it was doing, had a firm commitment, and showed clear direction in its discussion with other countries. An example of the kind of impression left was best summed up by Prime Minister Trudeau of Canada. Trudeau told others at one of the closing sessions, that the meeting was so good and so beneficial, that it should be institutionalized. He indicated that NATO should cover the entire agenda of issues before world countries as opposed to just defense. Since Canada has been a rather reluctant partner in NATO from time to time, it is interesting that he should be so enthusiastic. The Secretary noted that the framework was created at Brussels for a good discussion with regard to Turkey and Greece. The real cog seems to be who will put forth the first proposition, since it will then seem that party is making the concession. So the policy seems to be at a point where one country or the other will put forth a major proposal. The Secretary said that the only political party in Portugal is the military. The others for all intents and purposes were dead. His basic question about Portugal is why do they stay in NATO, and there seems to be two answers: 1) Because the public is not ready to accept the fact that they might pull out, and 2) Perhaps they are staying in to serve the Communist purpose. 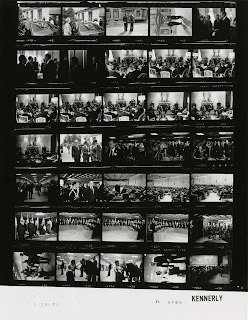 Cabinet Meeting Minutes, 6/4/75, Box 4, James E. Connor Files, Gerald R. Ford Library.